 In a novel that reads like a cross between the precise, stylized movements of traditional Noh dance-drama and the mawkish melodrama of modern-day soap opera, popular novelist Ariyoshi offers a fictionalized history of the origins of Kabuki theater. Based on 16th- and 17th-century historical accounts, the author imagines the life of Okuni, the legendary temple dancer who is said to have almost single-handedly given birth to the art form of Kabuki as it is known today. Traveling with her troupe of provincial dancing girls and with her greedy, unfaithful husband Sankuro, Okuni dazzles audiences with the startlingly light and prancing folk-dance steps of her village, which gradually evolve into much more radical performances involving cross-dressing and a popular comedic flavor intrinsic to Kabuki. As they travel from Kyoto to Edo and back, the dancers fall into and out of favor with the ruling elite, sometimes finding themselves dancing on a homemade stage in the prostitutes' quarter and other times in a palace chamber, depending on the social and political climate at the time. Throughout their travels, the author dramatizes both the power struggles within the troupe, fueled by jealousies and love affairs, and their intersection with the power struggles in another company. The love triangles and quadrangles involving Okuni are as complex and deftly woven as any daytime drama, yet the novel suffers from a repetitiveness, possibly born from the fact that it was originally published in serial installments. 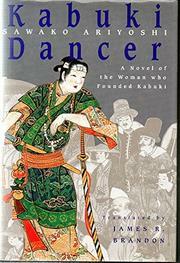 The author's convincing premise, that Okuni's need to compete with the bastardized versions of her Kabuki performed by prostitutes in theaters adjacent to hers forced her to be ever more innovative in her choreography and performance, ultimately suffers from overuse and repetition that stretches the bounds of interest. A two-dimensional and too-long fictionalization of the origins of Kabuki, which works better as a myth than as a novel.